Joe’s Bar and Restaurant is a local favorite hangout. The atmosphere is inviting, putting patrons at ease. Guests can expect to leave refreshed from Joe’s. Finding the location is easy. 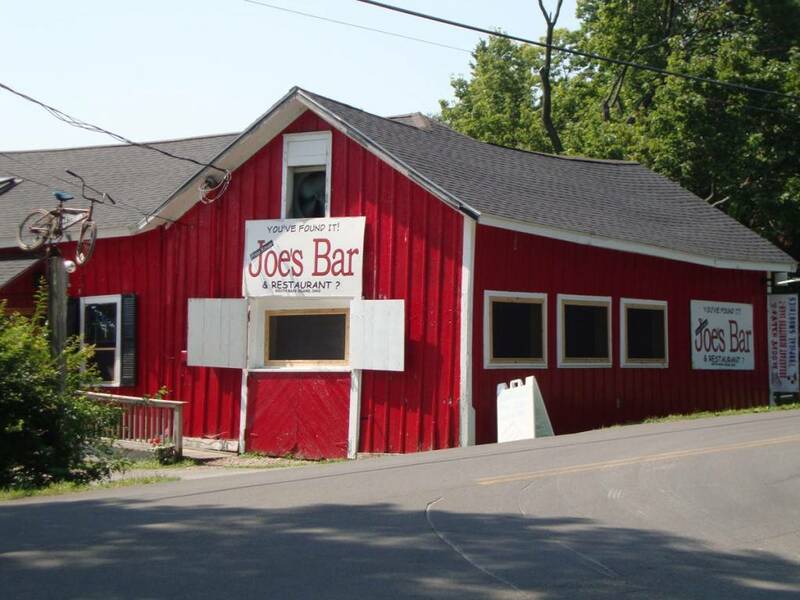 Joe’s is located on the corner of Meechen Road and Catawba Avenue. South Bass Island State Park is a short walk away. The building is very distinguishable with a striking red exterior. Moreover, the structure has a rich and lively history. Previously, the space was used as a press house for grapes. The wine making traditions of Put-in-Bay run deep. Here, the Doller press house, was integral in the wine production. Today, Heineman’s Winery continues the tradition. Joes is self-described as the “Best Dive Bar on the Planet.” However, there are many creature comforts for such a title. The large outside seating area is a must-see. Picnic tables line the area. Additionally, interesting chairs made from tree roots provide quirky seating. Also, over sized Jenga and corn hole are available for guests. Compared to downtown Put-in-Bay, Joe’s is a quieter place to enjoy the day. A full service bar awaits guests. Most importantly, be sure to try the signature Bloody Mary. Many guests have remarked that this is the best on the island of Put-in-Bay. Also, there is a stocked humidor with a selection of fine cigars. A cold beverage and nice cigar may be just what is needed for an island adventure. All of the relaxation may induce some hunger. Luckily, Joe’s has that covered. Start off a meal with a savory appetizer. Options include Artichoke Asiago Dip, Sloppy Joe Dip and Loaded Nachos. Paninis and Hot Dogs round out the lunch menu. Moreover, specialty hot dogs include a Chicago, Seattle and Mac & Cheese Dog. Additionally, the Sloppy Scotty is their most known dog. Topped with their signature Sloppy Joes, this choice hits the spot. A trip to Put-in-Bay and the Lake Erie Islands is a great Summer activity. Moreover, a trip to Joe’s Bar will feel as though you’ve became an islander. So, set your watch to “Island Time” and let your worries drift away.